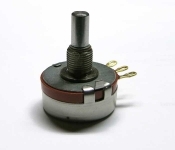 The potentiometer is needed to control volume. Often those with logarithmic characterics had been used because our hearing is more like that. Some amplifiers use pots with taps to increase low frequencies at low volume. This offers a more balanced sound when listening at low volume.